We’re loosening the purse strings this New Year’s, exploring off-the-beaten-path sparkling wine. It’s a category that rewards the expenditure of a few extra dollars in a most remarkable way, since most wine-making countries harbor an undervalued cache of little-known regional bubblies. Learn about them and you’ll find your way to some distinctive sips, which provide their own reason to raise a toast. Americans with any sense of adventure have encountered prosecco, the softly fruity, sudsy sip from Italy’s Veneto region, and cava, its only occasionally more serious-minded cousin and darling of Barcelona’s vibrant cafe society. Italy’s north also offers Lambrusco (don’t knock it till you’ve tried the authentic item from a conscientious small producer); while the French boast a kaleidoscopic variety organized as crémant, mousseux, and petillant, according to the multiple of atmospheric pressure under which it is bottled. None of this is meant to diss New World pop, which certainly has its own charms. It’s understandable that for about the same money some consumers will always be more comfortable with a California bubbly named Mumm or Roederer. They’ll do fine. 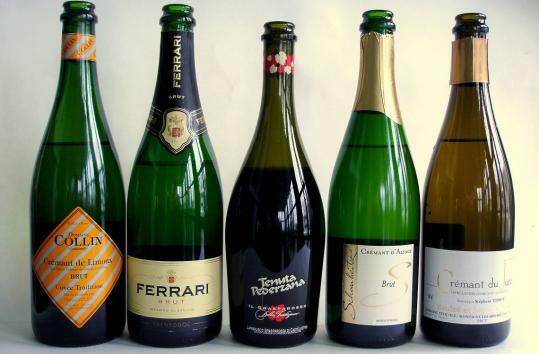 But if you’re keen to add some real panache to a New Year’s gathering, resolve to try one of these effervescent exotics. Domaine Collin Cremant de Limoux “Cuvee Tradition’’ NV Brut Lightly mineral aromas; moderately dry with gentle fizz and plenty of zip. This high-value bubbly, made by a former Champagne producer, is easy to like and distinctly party-friendly. Around $13. At Bina Alimentari, Boston, 617-357-0888; Charles St. Liquors, Boston, 617-523-5051; Salem Wine Imports, Salem, 978-741-9463. Ferrari Trento NV Brut We shared a half bottle at New York’s Eataly wine shop recently and were happy to be reminded just how tasty this can be. Offers hints of complexity, some welcome bass notes, and satisfying volume. Try with spicy nibbles. Around $16. At Wine ConneXtion, North Andover, 978-965-8000; Cambridge Wine & Spirits, 617-864-7171; WineNation, Millbury, 508-917-0400. Tenuta Pederzana “Il Gasparossa’’ Lambrusco Gasparossa di Castelvetro NV Wonderfully cheery, nearly fully dry, lightly sparkling red that does fine all by itself but comes into its own when there’s salami, mortadella, speck, or a slice of aged provolone on offer. Fruity but firm, with a trim, clean finish. Around $ 17. At Solera, Roslindale, 617-469-4005; Hi-Rise Bread Co., (Huron Village) Cambridge, 617-876-8766 ; the Spirited Gourmet, Belmont, 617-262-0379. Schoenheitz Cremant d’Alsace NV Brut Modestly aromatic; crisp with bright apple-y fruit and faint almond note; pair its lively acids with lighter hors d’oeuvres or first courses, or serve as a stand-alone aperitif. Around $20. At the Spirited Gourmet; Wine Sense, Andover, 978-749-9464; Colonial Spirits, Acton, 978-263-7775. Tissot Cremant du Jura NV Brut Enough zesty fruit and brisk acidity to make the most disaffected appetite stand up and salute; pale gold hue; a burst of bubbles and a mouthful of round satisfying apple-pear fruit. What a honey. Around $25. Blanchards Wines & Spirits, Jamaica Plain, 617-522-9300; Lower Falls Wine, Newton, 617-332-3000; Formaggio Kitchen, Cambridge, 617-354-4750.